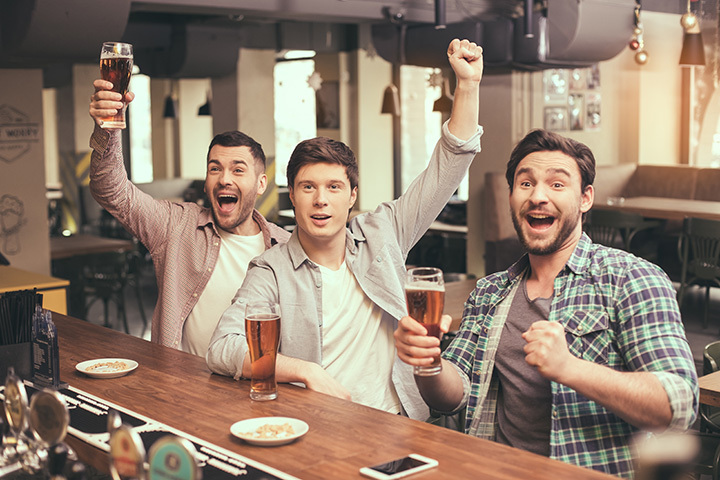 No matter where you live in Mississippi, you and your friends need a great place to hang out, grab a cold drink, and root for your favorite sports team among fellow fans. These are our picks for the 10 best sports bars in the state! Contact Lounge & Sports Bar is located inside the Palace Casino in Biloxi. Contact is a comfortable, smoke-free environment with daily specials and 35 widescreen TVs. You won't miss a minute of the game! In addition to their excellent beer selection, Contact is known for serving elevated bar food like deep fried chicken skins and brisket quesadilla! Looking for a place to try new beers while cheering for your favorite sports team? The Bulldog has 62 beers on tap, mostly local and craft selections, as well as 75 bottled brews. The food is upscale, most of which has a Cajun or Tex-Mex influence, and the knowledgeable staff will be happy to help you pair your meal with the perfect beer! If you're looking for a spot where the views will compete with the playoffs, you've got to try Little River Marina. The address says Moss Point, but the locals will tell you that you're in Escatawpa. Either way, you'll feel like you're in a different world as you sit high above the Bayou. Little River is the place to go when you're in the mood for down home cooking, cold beer, and great company. Kwitzky's Dugout is the type of place where you'll feel like a regular after only one or two visits. The bar has a baseball theme, but they're more than accommodating for fans of other sports, too. Kwitzky's doesn't serve food, but they do host a weekly potluck during football season, as well as an excellent beer selection. If you're looking for a place in Starkville to watch the Bulldogs play, stop by Stagger In Sports Bar. They're known for having cold beer and huge portions of food at a reasonable price. Add in the free Wi-Fi and you have the perfect recipe for college students who want a place to catch a game. And since they're open until 1:00 a.m., "stagger in" is exactly what you'll do! Last Call is the quintessential sports bar, with plenty of TVs, friendly servers, and a fully-stocked bar. They offer game day specials on both food and drinks as well as regular weekly specials like Top Shelf Tuesday and $4 Fridays. Customers love the great service, delicious food, and live DJ on the weekends. Who would possibly object when you tell them you're going to The Library? Oxford's cheekily-named sports bar is perfect for a college town, and they've been drawing Ole Miss fans to the Square for 15 years with live music, great food, and a fully-stocked bar. The Library has three main sections—a Sports Bar, Music Hall and Patio Balcony—and both the patio and Sports Bar are equipped with TVs to watch the Rebs play. Kelly's is an Irish-style pub known for their impressive beer selection. Formerly known as Kilted Kelly's (thanks to the plaid skirts worn by the waitresses), they're located in a beautifully renovated building in downtown Gulfport adjacent to Fishbone Alley. The owners, Jack and Kelly, are partnered with renowned local restaurateur Rob Stinson, so you know the food here is spectacular. Andrew's is a cozy little sports pub just a few blocks away from the Mississippi River in Natchez. Guests can enjoy darts, pool, and even corn hole and foosball, or they can sit at the bar and catch Saints game. Andrew's is known for throwing crawfish boils when it's mudbug season. Keep an eye on their Facebook page so you don't miss the fun! If you're in North Mississippi and you're looking for a spot to hang out with your friends, Safari has it all. They're a sports bar, a nightclub, a country dance club—there's something for everyone. Keep an eye on their Facebook page for events like karaoke and live music, or just drop in for a bite to eat while you watch the game.